Next-generation sequencing technologies are revolutionizing the field of evolutionary biology, opening the possibility for genetic analysis at scales not previously possible. Research in population genetics, quantitative trait mapping, comparative genomics, and phylogeography that was unthinkable even a few years ago is now possible. More importantly, these next-generation sequencing studies can be performed in organisms for which few genomic resources presently exist. To speed this revolution in evolutionary genetics, we have developed Restriction site Associated DNA (RAD) genotyping, a method that uses Illumina next-generation sequencing to simultaneously discover and score tens to hundreds of thousands of single-nucleotide polymorphism (SNP) markers in hundreds of individuals for minimal investment of resources. 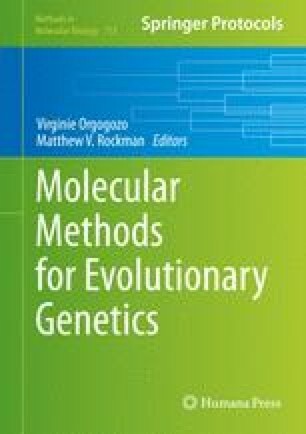 In this chapter, we describe the core RAD-seq protocol, which can be modified to suit a diversity of evolutionary genetic questions. In addition, we discuss bioinformatic considerations that arise from unique aspects of next-generation sequencing data as compared to traditional marker-based approaches, and we outline some general analytical approaches for RAD-seq and similar data. Despite considerable progress, the development of analytical tools remains in its infancy, and further work is needed to fully quantify sampling variance and biases in these data types. The authors thank the University of Oregon researchers who, over the past 3 years, have helped troubleshoot many preliminary ­versions of this protocol. This work was funded by grants from the National Institutes of Health (1R24GM079486-01A1 and Ruth L. Kirschstein National Research Service Award F32 GM078949) and the National Science Foundation (IOS-0642264 and DEB-0919090).